One of the most intriguing studies I found when preparing to launch RelyLocal was a research paper out of the Leopold Center at Iowa State, titled “Checking the Food Odometer: Comparing Food Miles for Local Versus Conventional Produce Sales“. In short – the average carrot travels 1,838 miles before it reaches your table. Think about that for a minute… That’s like driving from Portland, OR to Kansas City… For a carrot! Meanwhile – unless you are living in a drought-filled dust bowl, there are plenty of local farmers’ markets filled with local producers (your neighbors) who would love your business! Do you want to reduce America’s dependency on foreign oil? 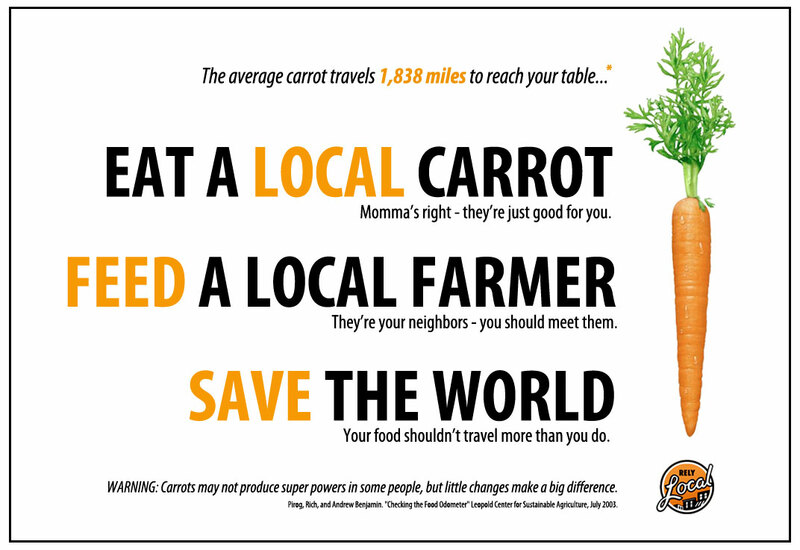 Eat a local carrot! Our less-than-official motto: Your food shouldn’t see more of the country than you do! My food shouldn’t travel more than I do. Great point!! I would much rather get it from my neighbor! If more of us would try to apply just a little more common sense like supporting local farmers and our local economies to our decisionmaking and behavioral habits… we could be part of the solution instead of the problem. Sometimes it’s just that simple.